The diplomatic feud between Canada and Saudi Arabia caught most officials, at least in Ottawa, completely off-guard. In retaliation, the Saudis recalled their ambassador, froze new business and investment deals, cancelled flights to and from Toronto, halted imports of Canadian wheat, and brought back thousands of Saudi students, trainee doctors and patients. The scope of the response left most Canadians perplexed. After all, Ottawa has routinely criticized Saudi Arabia’s human rights record in the past without much in the way of repercussions. And so, Canada’s foreign ministry went into damage control and announced that it was “seeking greater clarity” with regard to Riyadh’s actions. But the clarification appears to have come from Washington rather than the Saudis themselves as the US government declined to come to Canada’s defense. Speaking to reporters earlier in the week, the State Department’s spokeswoman, Heather Nauert, put Canada and Saudi Arabia on an even keel, describing both as close allies. She then called on the two countries to resolve their differences – alone. “We can’t do it for them,” Nauert remarked. Moreover, when asked whether Washington would publicly decry the recent arrest of activists in Saudi Arabia, Nauert said she wasn’t “going to get into this”. “Some of these issues we choose to discuss privately,” she stated, in what sounds a little bit too much like a direct swipe at Chrystia Freeland’s condemnation of Riyadh. For Canada’s Prime Minister Justin Trudeau, Nauert’s responses should serve as yet another reminder that his country is a major front in the global trade war initiated by the Trump administration. For the first time in a generation, goods and services, accustomed to moving freely between Canada and the US, are now being taxed. Earlier this year, US President Donald Trump fired the first shot when he imposed his steel and aluminum tariffs. By July, both Canada and the US had levied billions of dollars in tariffs on each other’s goods. This sentiment also extends to the ongoing negotiations between the two countries over the North American Free Trade Agreement (NAFTA). Trump, who makes no secret of the fact that he detests Trudeau, repeatedly showed his displeasure with the results of months of talks, as he explored ways to pressure Ottawa into making further concessions. Having cultivated a close relationship with Saudi Arabia’s Crown Prince Mohammad bin Salman, Trump and his son-in-law/advisor Jared Kushner have successfully utilized the recourses of the oil rich Kingdom in a number of arenas. From the Israeli occupation of Palestine to Washington’s campaign against Iran and the billions in investments in the struggling American economy, Bin Salman has emerged as one of the Trump Administration’s most valuable assets. While it is entirely possible that the young crown prince was offended by Freeland’s harmless Tweet, it is a lot more likely that her true crime and that of the Trudeau government is their refusal to “back down” in their trade war with Trump’s White House. 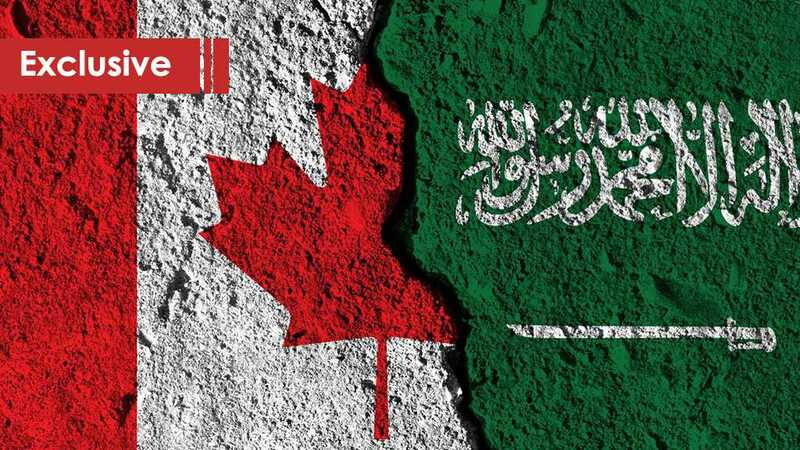 For Washington, the real value of the Saudi spat with the Canadians is its ability to jeopardize a USD 13 billion contract between Canada’s weapons manufacturer General Dynamics Corp and Riyadh. The deal, which is still being finalized and involves the construction of light-armored vehicles for Saudi Arabia, was described as the largest advanced manufacturing export win in Canadian history. Its 14-year follow-up support arrangement guarantees thousands of Canadian jobs. Scrapping it would undoubtedly place further strain on the Canadian economy and in turn Trudeau’s government. Saudi Arabia’s Foreign Minister Adel Al-Jubeir has already warned of “additional measures against Canada,” in what observers believe to be a direct reference to the very lucrative weapons contract. The veiled threats have given way to a growing sense of panic in Ottawa where officials reportedly reached out to Britain to mediate in the diplomatic impasse. This week, a spokesperson for the US Central Command indicated that it was entirely possible his country played a role in a Saudi airstrike that killed 40 Yemeni children on Thursday. “We may never know if the munition [used] was one that the US sold to them [the Saudis],” Josh Jacques was quoted as saying by the Vox website. He also said that it is unclear if the US was involved in refueling planes for the attack on Yemen’s Saada province where the strike butchered a total of 51 civilians. Of course, Jacques’ comments are not exactly earthshattering revelations. If anything, he is downplaying the true extent of American involvement in the Saudi-led military campaign against Yemen, which has martyred tens of thousands and is starving an entire population. However, for Western arms manufacturers and governments alike, the carnage in Yemen is too lucrative an opportunity to pass up. The US and the UK are at the forefront of arms exports to Riyadh and its allies. But Saudi Arabia has also been ranked as a top destination for Canadian weapons shipments. Between March 2015 and early 2018, the Canadian government approved more than USD 284 million in arms exports to countries bombing Yemen. And just like their American counterparts, Canadian officials were unable to say whether their weapons were used in Yemen. In spite of the blatant contradictions, Ottawa still boasted about donating USD 65 million to ease the suffering of the Yemeni people, in what was meant to be yet another demonstration of its commitment to human rights and liberal values. Similarly, Chrystia Freeland’s latest Tweet criticizing Riyadh comes shortly after she buried a government report about the use of Canadian armored vehicles in last summer’s massacre of Shiite residents in Saudi Arabia’s eastern province. This serves as another illustration that the row between Ottawa and Riyadh has nothing to do with anyone’s concerns about human rights. The more likely culprits are trade agreements and the billions of dollars in lucrative arms contracts.